Ok, so the title is a bit of an exaggeration. But it provides a framework for what are, Donald Trump’s antics notwithstanding, some of the biggest questions about Thursday’s debate. These questions include: what is the state of Republican ideology? What kinds of governing ideas is the party offering? And with 17 candidates vying for the nomination, what are the questions that divide the party? As they anticipate an election without an incumbent, after eight years of a Democratic president, how do GOP candidates position themselves in relation to the past? Obviously, breaking away from the Obama presidency is a key idea, at least in the abstract. Affirming the legacy of their own party is a more complex matter. As I’ve noted here, the leading candidates in the field have had a tough time figuring out their relationship to the Iraq War and the Bush foreign policy legacy. Bush is a risky point of reference – recent and controversial. 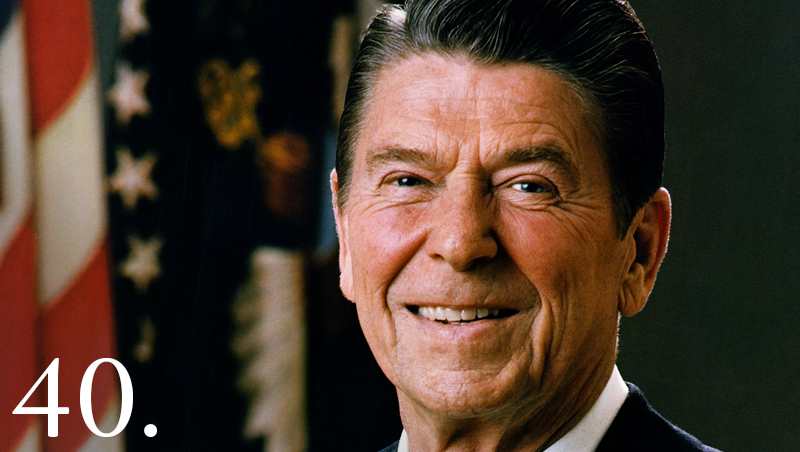 Much more common in Republican discourse is Ronald Reagan, whose skillful rhetoric helped bring socially conservative ideas into the party mainstream and integrate them with economic conservatism, developed a narrative of national strength, and provided the ideological basis of a new Republican era. There was, of course, discussion on Twitter of the pervasiveness of Reagan reference from the candidates. (Paul Waldman at The Week notes that Reagan mentions were sparse, though.) NPR’s Lauren Leatherby includes Reagan references in her “by the numbers” analysis (although, as I show below, my estimate is slightly different from hers. 1. Reagan references were, in broad comparison, somewhat sparse in the first 2015 debates. By my count, there were five unique Reagan references in the prime time debate. The difference between my count and Leatherby’s is accounted for by the fact that she counts two Reagan mentions in the same paragraph as two separate instances. There were more in the undercard debate (6) than the later one, but even if you add them together, it hardly stands out. 2. The number of Reagan references varies quite a bit. This is somewhat true over election seasons: the average number of unique Reagan references in the 2000 debates was 5.1; for 2008 it was 9.9; and for 2012 it was about 6.5. Within election seasons, we see much greater variation. Some of the debates in the chart above were held at the Reagan Library, and these tended to be heavy on Reagan references. In one of the two (!) 2008 season debates held there, the candidates were asked whether and why Reagan would endorse them, and so that added to mention count (bringing it to 38, or almost 4 times what we saw on Thursday in both debates). So that explains some of the variation. But not all of it. Only one of the forty-seven debates listed here lacked any Reagan references, but lots of them had only a few. This even includes a debate held in 2011 in which the candidates responded to a clip of Reagan talking about deficits. The theory of political time explains this in terms of two factors. First, with a Republican incumbent, it’s harder for Republican candidates to present themselves in opposition to the status quo. They need another point of reference to justify and contextualize their ideas. Second, presidents like Bush, who “articulate” the values of the most recent reconstructive party leader, often create controversy over the real meaning of the party’s ideological heritage. In one of the 2008 debates, Romney and McCain argued over the legacy of Reagan’s foreign policy; throughout the debates that year, candidates tried to apply visions of Reagan’s legacy to economic and social policy questions as well. 4. Not all Reagan references signify the same thing. Most – but not all – references are symbolic and about ideological debate. Typical Reagan references touch on his vision for the nation, the Reagan “revolution” or the return to national strength. But there are exceptions. Mike Huckabee noted in a January 2008 debate that even Reagan made mistakes, citing the “amnesty” issue in immigration policy. And Donald Trump, in the midst of many more controversial remarks, pointed out on Thursday that Reagan “evolved” on policy issues. This statement isn’t so much noteworthy for its substance, but rather for the fact that Trump referred to Reagan as an actual human politician rather than a symbolic figure. It’s important not to read too much into Thursday’s debate, but looking back over the prime time transcript, the Reagan references fall into two categories. There are the purely symbolic ones, like Ted Cruz’s statement that the American hostages held in Iran were released the day Reagan was inaugurated. * And there are the ones that invoke Reagan to move away from the mainstream conservative positions on issues. Rand Paul spoke about how Reagan negotiated with the Soviets; Kasich talked about Reagan’s expansion of Medicaid. This, too, is indicative of disjunctive politics – evidence of a party that is simultaneously trying to affirm and reexamine ideological commitments (Waldman points this out too). 5. Lots of questions remain. It would also be useful to know whether Reagan references are made at similar rates by different types of candidates, which issues they’re associated with, etc. But this gives us a sense that at least in this first debate, Reagan’s prominence as a reference point was, in comparison with the recent past, about average at best. The next debate is at the Reagan Library, so we’ll see what happens then. *A debt of gratitude is owed here to Lauren Leatherby for helping me figure out that I was looking at an incomplete transcript.